WATERFRONT! UPDATED RUSTIC COTTAGE! EXTRA LOT! IMMEDIATE EQUITY! 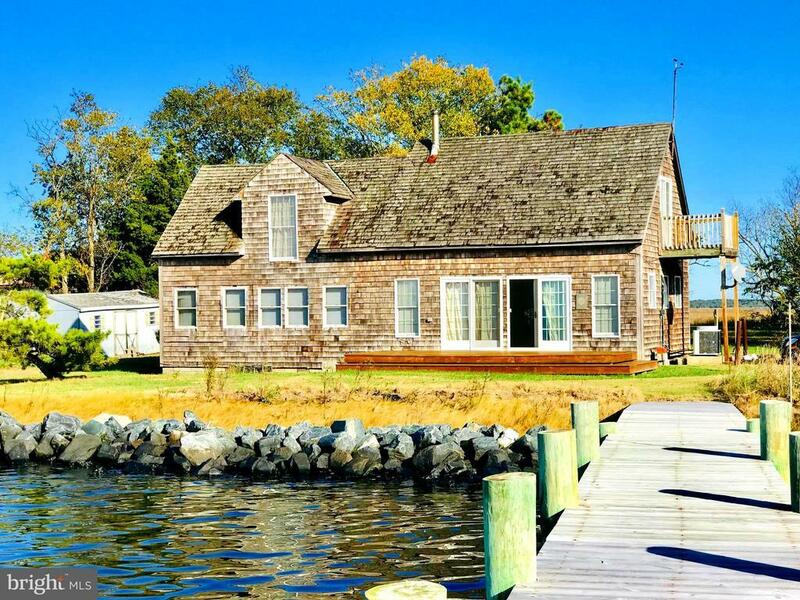 Original 24x16 WATERFRONT Cottage was improved with a 24x20 Addition that includes Hardwood Floors, Anderson Windows and Sliders, 2 Sleeping Lofts (1 With a Balcony), and a 24x10 Deck Overlooking the Manokin River as it flows into the Chesapeake Bay. February, 2019 Upgrades include a Wall Mounted Split System Heat/Air Conditioning Unit, Replacing and Repairing Cedar Shake Shingles on the Roof and Wrapping the Waterfront Windows with Cedar Planks. Numerous Windows and Sliders offer a Wonderful Cross Breeze during the Summer and the Wall Unit are Supplemented by a Wood Burning Stove and a Gas Fireplace for a Cozy Warmth during Cold Weather. Property offers 2 Lots totaling almost .9 Acre and both properties are Assessed at $241, 000, creating $16, 000 of INSTANT EQUITY! No Matter the Season, this property offers wonderful Year Round Waterfront Views, a Rustic and Restful Updated Get Away, or a Year-Round Home. Home is located less than 1 Mile from the Goose Creek Marina that offers Boat Repair, a Public Boat Ramp and a Fresh Seafood Restaurant and Tiki Bar. Great Hope Golf Course is less than 10 Miles from Home. Food Shopping, Restaurants and Shops are located in Princess Anne, which is less than 15 Miles from Home. Just bring your toothbrush because the Home is being offered Fully Furnished! Directions: Rt. 13 South to Rt. 413. Right on Fairmount Rd and continue for 7.3 miles. Right on Rumbley Rd and continue for 1.7 miles. Right on Riverview Rd. House is .6 mile on left.